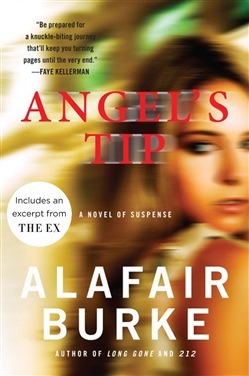 “Angel’s Tip is a riveting read that snaps with the beat of New York….A knuckle-biting journey that’ll keep you turning pages until the very end.” —Faye Kellerman, bestselling author of the Peter Decker and Rina Lazarus novels “Alafair Burke has created a winning heroine in Ellie Hatcher, someone to root for.” —Tami Hoag, bestselling author of Down the Darkest Road “Complex plotting, multi-layered characters, a creepy serial killer—in Angel’s Tip, Burke has once again proven herself a terrific storyteller.” —Sandra Brown, bestselling author of Lethal Acclaimed thriller writer Alafair Burke delves into the underworld of the Manhattan nightclub scene in Angel’s Tip. Burke is the daughter of crime fiction superstar James Lee Burke, creator of Cajun detective Dave Robicheaux, prompting the Fort Worth Star-Telegram to proclaim that “this fast-paced-but-human thriller proves that writing talent is genetic.” A superb crime novel featuring NYPD Detective Ellie Hatcher (“a strong female protagonist in the tradition of Sara Paretsky’s V.I. Warshawski and Marcia Muller’s Sharon McCone” —Boston Globe), Angel’s Tip follows Ellie’s investigation into the murder of a young college student, quite possibly by a member of New York’s young moneyed elite, and fans of Lisa Gardner, Karin Slaughter, Harlan Coben, and Sue Grafton will most definitely want to trail along. Acquista Angel's Tip in Epub: dopo aver letto l’ebook Angel's Tip di Alafair Burke ti invitiamo a lasciarci una Recensione qui sotto: sarà utile agli utenti che non abbiano ancora letto questo libro e che vogliano avere delle opinioni altrui. L’opinione su di un libro è molto soggettiva e per questo leggere eventuali recensioni negative non ci dovrà frenare dall’acquisto, anzi dovrà spingerci ad acquistare il libro in fretta per poter dire la nostra ed eventualmente smentire quanto commentato da altri, contribuendo ad arricchire più possibile i commenti e dare sempre più spunti di confronto al pubblico online.